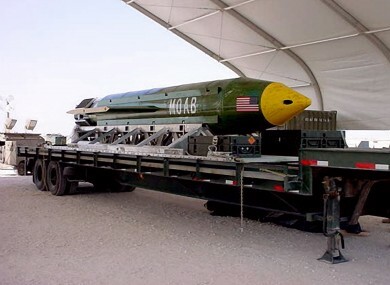 THE UNITED STATES has dropped a GBU-43/B Massive Ordnance Air Blast (MOAB) bomb, otherwise known as the ‘Mother of All Bombs’, on an Islamic State stronghold in Afghanistan’s eastern Nangarhar province. It is the first time the bomb, developed in the early days of the Iraq war, has been used in combat. But what exactly is it? We take a look. How powerful is the MOAB? The 9.8-tonne guided bomb, the largest non-nuclear weapon in America’s arsenal, is described by the US-based GlobalSecurity.org watchdog as “large, powerful and accurately delivered”. It is a demolition bomb containing 18,700 pounds (8,480 kilogrammes) of the explosive H6, the watchdog’s website says, with a blast yield equivalent to 11 tons of TNT. Nine metres (30 feet) long, with a diameter of one metre, according to GlobalSecurity.org, it is the largest-ever satellite-guided, air-delivered weapon in history. Popular Mechanics described it as weighing as much as an F-16 fighter jet. Guided by GPS, it is dropped from the cargo ramp of a C-130 transport plane with its descent slowed by parachute, meaning it can be deployed from a greater height — giving US pilots more time to reach safety. It is a concussive bomb, meaning it is designed to detonate before it hits the ground. Its thin aluminium skin helps to maximise its blast radius and generate a shockwave which Wired.com said can reach up to 150 metres. It was developed in 2002-2003 by Alabama-based aerospace and defence company Dynetics in partnership with the Air Force Research Lab (AFRL), according to the company’s website. The website said the bomb’s preliminary concept was developed into a detailed design within just three months, and successfully tested three times in 13 days. It was first produced for use in the early days of the Iraq war. According to the Air Force, the last time the MOAB was tested in 2003, a huge mushroom cloud could be seen from 20 miles (32 kilometres) away. The US Air Force said the target of yesterday’s bombing was a tunnel complex in Achin district in Afghanistan’s eastern Nangarhar province, a hotbed of Islamic State (IS) militancy on the border with Pakistan. Achin District Governor Esmail Shinwari said the bomb landed in the Momand Dara area while the defence ministry said the attack killed at least 36 IS militants. A damage assessment is still being carried out. The area is extremely remote and mountainous, inaccessible to government forces. It is north of Tora Bora, the complex network of caves from where Al-Qaeda leader Osama bin Laden gave US forces the slip and escaped into Pakistan in late 2001. The US said it believed the area was so remote that no civilians were in the area. The strike hit a system of tunnels and caves that IS fighters had used to “move around freely, making it easier for them to target US military advisers and Afghan forces” nearby, White House spokesman Sean Spicer said. Email “What is the 'Mother of All Bombs'?”. Feedback on “What is the 'Mother of All Bombs'?”.